InnoViz has started mining data. This graph shows information about how technology makers describe themselves on their Appsterdam Meetup profile page. 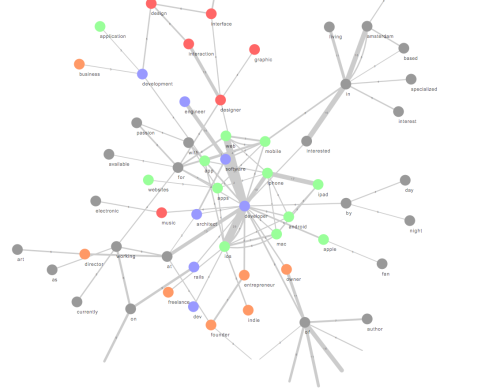 Each node represents a word that is used, the lines between nodes show how often words co-occur in texts. Each node is color coded. Green stands for a platform, orange stands for a word that is linked to a business, blue indicates a term expected from a developer and red is a term from the design perspective of an app. The thickness of a line shows how often two words occur together in a profile description. Join us at PICNIC (17-18 September) for a text analysis and word visualization workshop at the App Ecosystem Tent.